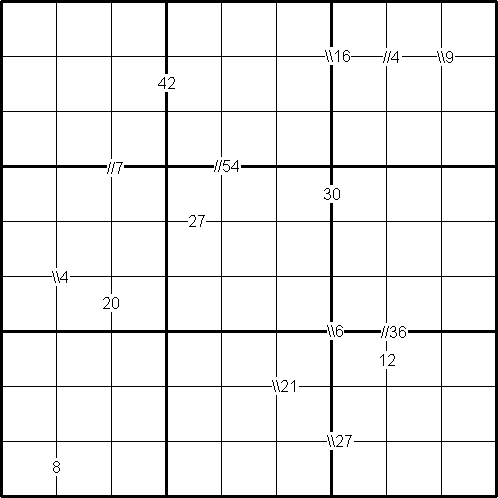 Each small clue-number is the product of two digits in the two squares that are horizontally or vertically or diagonally adjacent to each other. The position of each pair of diagonally adjacent squares is indicated by either two forward slash marks // or two backward slash marks \\. the //36 on intersection of border lines between the diagonally adjacent squares (6, 8) and (7, 7) means that possible pairs of numbers in the squares are: 4 and 9 or 9 and 4 or 6 and 6.
the \\6 on intersection of border lines between the diagonally adjacent squares (6, 6) and (7, 7) means that possible pairs of numbers in the squares are: 1 and 6, 6 and 1; 2 and 3, or 3 and 2.
finally, the clue-number 8 on the border line betweeen the squares (9, 1) and (9, 2) means that possible pairs of numbers for these squares can be from the following combinations: 1 and 8, 8 and 1; 2 and 4, or 4 and 2. Working systematically. Mathematical reasoning & proof. Visualising. Networks/Graph Theory. Combinatorics. Creating and manipulating expressions and formulae. Multiplication & division. Mathematical modelling. Logo. Games.